Lay the foundation for a space that is smarter and more sustainable with TecCrete access flooring. Ideal for spaces such as offices, schools, libraries, computer rooms, museums and casinos — any environment that requires strong and quiet access flooring. The exposed concrete surface offers a unique aesthetic that is beautiful enough to leave bare. Or cover it with modular carpet, laminate, vinyl, tiles or almost anything you chose. 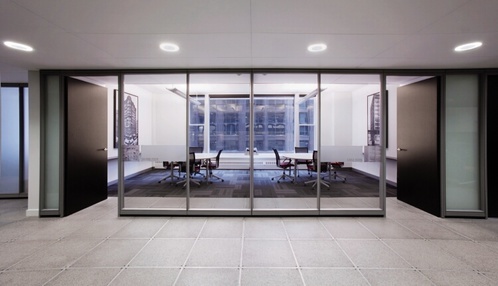 Either way, you get a surface that feels rock solid underfoot, unlike ordinary steel access floors. 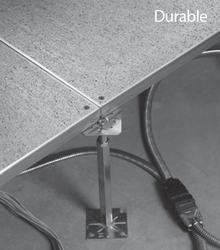 Click here for the Haworth TecCrete Product Guide. TecCrete isn’t steel computer room floor adapted for office use. Offering a concrete and steel composite structure that flexes 50% less than an ordinary steel access floor panel when walked on, TecCrete eliminates the feeling of being on an access floor. Unlike steel access floor, TecCrete’s weldless construction can handle the heavy rolling and impact loads that occur during construction, move-in and reconfiguration without weld points breaking, or surface denting or dishing. TecCrete’s 10-pass rolling load performance exceeds the equivalent welded steel panel by 20%. When compared to the common "cupped" underside of steel access floor panels, the TecCrete panel’s flat underside results in less expensive installation and more reliable sealing of underfloor plenum dividers. 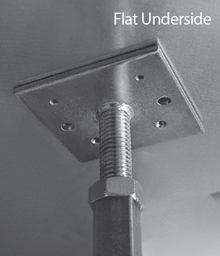 The flat underside also allows for placement of pedestals anywhere under the panel, making support of partial panels at walls and columns easier and more secure. Not only does TecCrete contain 58% recycled content, it’s achieved SCS Indoor AdvantageTM Gold certification. What’s more, it’s the only American-made access floor manufactured in a zero-landfill facility. 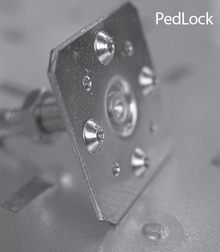 TecCrete’s unique PedLock feature assures positive mechanical engagement between the pedestal head and floor panel, resulting in stable installation with or without cornerlock screws. When compared to the equivalent cement-filled steel panel, TecCrete offers 20% better 10-pass rolling load performance. In addition, TecCrete has a proven record of performance and safety with no reported failures after more than 25 years and tens of millions of square feet installed.